Connor has appeared in several other television shows, plays, etc. 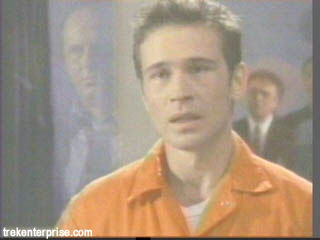 Connor played a convicted murderer set to be executed. No other info yet, but keep your eyes posted for reruns. Connor played a rebel leader named Samson, fighting to overthrow a corrupt and evil religious government. In a tremendously tight black t-shirt. He gets the second half of the show for himself, and does a great job. The character is funny, cool, strong, and noble. Quite a few touches of Trip are visible here (or vice versa). 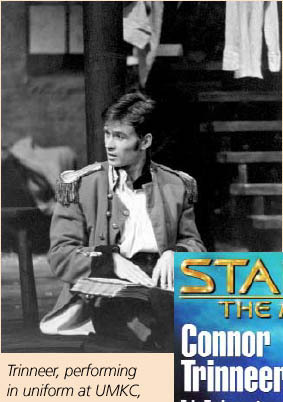 Connor had a major role in this PBS production about racism and the military in Japan. Connor played Bob Munger, a gay officer whose secret is discovered. It is on video and DVD soon. Our very own srtrekker (and S.O.) 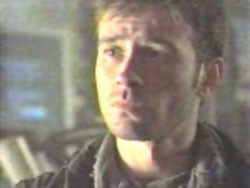 had MANY WONDERFUL THINGS to say about the movie and about Trinneer. In reading your bio, we see you starred in Billy Crystal's baseball movie, *61, which pays homage to Roger Maris' homerun record. CT: I'm a giant baseball fan. In fact, I'm almost a bigger fan of the history of the game than I am of specific teams. I mean, I can sit and watch a double header on TV. I'm that kind of fan. When they were casting this thing and I knew this was coming down the pike, I got onto my agent and manager about auditioning for the role of Roger Maris. That role went to Barry Pepper, who was brilliant and perfect for it. Afterwards, I knew they were casting the smaller roles, and I told my agent I didn't care, I just wanted to be part of the project. I know all these baseball guys. I grew up reading about them. The whole race and how it involved Whitey Ford, Roger Maris, and Mickey Mantle. I just wanted to be a part of the movie. I went back in and did a read for Billy Crystal, who's a big baseball fan, too. At the audition, he began to ad lib. I went right with him, because I know it. I know all the history. Who did you play in *61? CT: I play a reporter who sits at the table with the Baseball Commissioner and a number of other baseball writers and we're talking about whether an asterisk should be put in front of Maris' home run record, and I vote that it should be. I was really honoured to be a part of that love letter to baseball.